Pakistani President Pervez Musharraf has announced that he is resigning. He had faced impeachment by parliament on charges of violating the constitution and gross misconduct, which he has denied. Here BBC website readers from around the world give their reaction to the news. President Musharraf is a classical example of a democratic leader. He will forever remain a model to most of us, holding the tenets and ideals of democracy in the 21st century. Mr Mugabe (Zimbabwe), Bwana Mwai Kibaki (Kenya) and other illegitimate and power hungry leaders can learn from President Musharraf. I was shocked to see that President Musharraf has stepped down. I have seen many good things happening in the President's tenure. In my opinion Musharraf was a thousand times better then the other party or religious leaders. If the government and the other parties say that Mr Musharraf is accountable for what he did, then I believe that the current parties should also look back to the past at what they have done, and they should also be held accountable for what they have done. Musharraf should have resigned long ago. He might have been an able leader but the way he functioned and the way that his government functioned is dictatorial. If he worked for the interest of the country then he should have tried his best to bring back democracy. Statesmanship does not mean suppressing your opponents. Musharraf should be blamed for his own fall. But the question is how long will democracy function in Pakistan, in a country which is famous for coup d'etat? 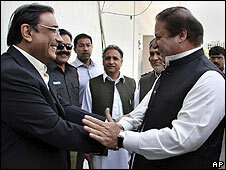 Pervez Musharraf's resignation is a welcome development and is long overdue. He has plunged Pakistan into a deep mess that will take a very long time to clean up. My congratulations to the people of Pakistan. It is good to know hard hearts can still have a rethink in this new age of politics and government in the world. This should be seen as a great beginning for Pakistan, though the greatness could be negative or positive depending on the people in the seat of power. My country has really improved since the exit of the military men which I believe Musharraf is. I think that Musharraf is right to resign. After a good job done for his country, it's fair that he takes a rest. The coalition government must move very fast to establish its authority over the issue of terrorism, otherwise it will not last longer than Musharraf. At least he goes in peace, and probably the first to be replaced alive. I wish him a better future. God help us now, we have welcomed the feudal system back to power. Sure Musharraf made decisions that were appalling, but anything is better than bringing those old feudal parties back in. Economic decision making is down the hill and the public's hunger for political news is the only thing that is being fulfilled. Hope is what keeps everyone going, lets hope the new government can at least bring in think tanks and better (much better!) decision makers. One suspects that no politician would like to go through an impeachment process and then be kicked out, but many hang onto power and have to then be levered out... see Mugabe. So the best choice is to get out now and maybe enjoy a long retirement or some well-endowed consultancy work. 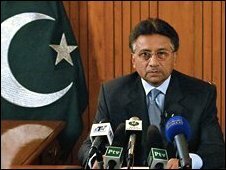 I am not sad to see Mr Musharraf go, on the other hand, I just hope that Pakistan can maintain a democratic spirit in the face of many challenges economic, political and social. It is good that the President has decided to resign as it reflects the will of the people. However, he should not be tried for the crimes as the 'charge sheet' of the current alliance government states. Such a trial would be a trial of personal vendettas. The current alliance government has many charges that they requested be waived when the elections where held. So let bygones be bygones and take the country to its rightful economic and social power. This is something that was somewhat expected but not this soon. Musharraf as someone else also said was cleaning up a 49 year old mess and we needed him then and we still need him. If someone comes into power now, it must be someone who can do better than Musharraf because that is what Pakistan needs right now. We will need all the luck we can get to find someone better than him! He has played all his cards. Time to step down before a coup, as usual, does the inevitable. It is also a good opportunity to see whether Pakistan is on the right track to real democracy, or it is only playing to settle scores, vendetta style. He was a misfit in Pakistan, a straight talking honest person who did everything for Pakistan. Only time will tell. I am sad to lose a man like him. I have no faith in the future of Pakistan. He should have resigned two months earlier or the day election results were declared. In this way he would have maintained respect. In the present situation even the majority of women in Pakistan who are not interested in politics are also talking against Musharraf. One thing I will say is he is the one who made media free in the country. The current Government must put him on the stand, so in future none of the Generals can organise a coup. Generals should improve their occupation as soldiers, able to defend the borders of the country. President Musharraf was the best thing that happened to Pakistan, he brought Pakistan forward and during his power Pakistan gained a better name among the nations of the world. He was an intelligent leader who protected the rights of minorities especially Christians. The public has no idea what they have done by supporting anti-Musharraf parties. Today is a black day in the history of Pakistan.